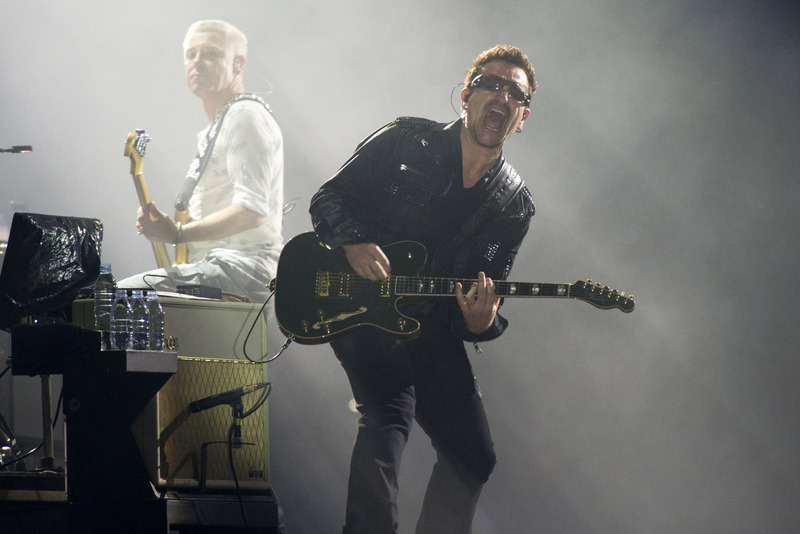 Here is a picture of Bono's handwired AC30 that was used for the U2 360 tour. Chris Robinson plugs his Vox guitars into this amp. The Official Vox Amps [Facebook page](https://www.facebook.com/VOXamps) cites Kevin Parker using a Vox AC30H2 amp in this Facebook post. Guillermo uses this amp on the ''Mismo Sitio, Distinto Lugar'' South American Tour. The VOX Heritage Collection AC30H2 30W combo amplifier features 2 channels of classic VOX tone. Channel 1 is an EF86 tube-based channel and channel 2 is VOX's famed 12AX7 based top-boost channel. The AC30H2 hand-wired amp is loaded with 2x12" VOX/Celestion Alnico "Blue" Speakers. Other premium appointments on this Vox amp include genuine leather handles and vintage cream covering. by the way, I stick to the EF86 channel on my DC, did you have a similar experience with the heritage ac30? I am also a real fan of the normal channel on my actual voxes though.... I love a good top-boost clean sound, but for truly dirty lead playing the normal channel has the mids and plenty of great texture with a treble boost in-line a la brian may. With the EF86 you don't even need that. The original EF86 brilliance channel has THE sound and even delivers a full bodied clean for country leads. Pop an old mullard ef86 in there with a hifi-grade dampener on it and you are golden. Anyway, its nice to see another vox fan on EB who really knows their vox. It seems like people mostly just know the AC30 by reputation and don't really get down with its history and they sould because every little change really effects the sound of these amps in interesting ways, unlike fender circuits that are way less sensitive to component value changes. I am totally rambling at you dude. thanks for the eloquent ramble mate! Enjoyed it! Agree that the H2 is not totally pure in more ways than you reference but really packs a nice punch anyway. We know the only thing better costs 2 to 3 times as much and needs a reliable backup especially with the lower value bias resistor. huh, my experience with my kit C30 clone is that its anything but cardboard. It definitely has more highs and lows on tap, is considerably louder than my '62 (they are about even when I put the C30 in 1/2 power), and has a refined hifi sheen that maybe didn't translate well to the recordings you've heard. In the room it has an amazing 3D quality with gorgeous swirling chime and this midrange "bloom" that you can't appreciate until you get 4 or 5 feet from the cabinet. It does NOT like to be close miced unless you use 2 microphones in near coincident. But it doesn't have the softer attack of a JMI and with the wrong speakers the chime can get overbearing, more of the percussive 'meanness' of an early Marshall but with better sustain when playing bone clean. On the other hand the dual rectifier slots allow you to change the voltage swing a lot just by dickering with the rectifier tubes. Dual 5Y3 rectifiers in full power tames the output a little, browns the sound a smidgen in a voxy way, and gives the amp gobs of compression and less punchiness without sacrificing its cool midrange bark under overdrive. those Matchless get bad-mouthed by some of the players I know so I haven't really explored them but while I can hear the balls of my H2 when Rich Robinson plays one on youtube I've never been blown away by any of the players I've heard on TV using the Matchless. Maybe you have a great Matchless link? See and hear The Black Crowes' Rich Robinson's AC30H2 on this beefy rendition of "Jealous Again"
check out Rich's sweet Telecaster breaks at 1:29 and 2:30 so characteristic of vintage AC30s ! !